Editor's Note: This is the third story in the Tackle Resistance series to help farmers better understand how to manage herbicide resistance. If U.S. farmers are to maintain herbicides as viable tools for corn and soybean weed control, they can start by throwing a lot more shade at resistant weeds–and even a little cold steel in the right situations. 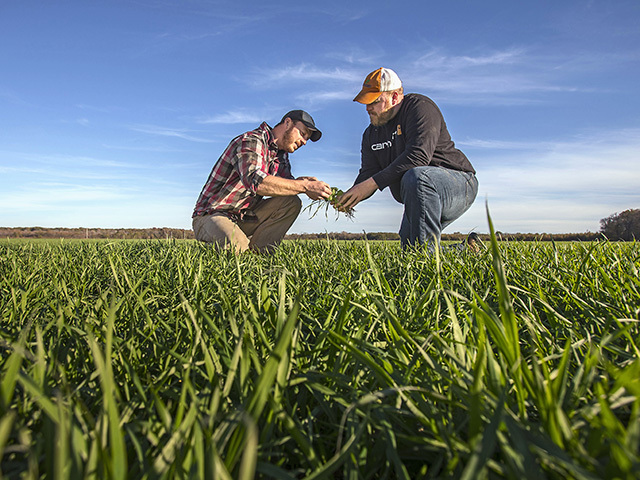 Practices such as narrow rows and cover crops deprive weeds of sunlight that result in fewer emerged weeds and less pressure on herbicides, weed scientists say. Certain types of tillage also can take advantage of a major weakness of Palmer amaranth and waterhemp–the low shelf life of their seed when buried in the soil. Larry Steckel, University of Tennessee Extension weed scientist, says farmers in his state are leaning more on cover crops to manage resistant weeds. Most Tennessee growers plant wheat or cereal rye cover crops, the latter mixed with either vetch or crimson clover to increase biomass. The cover crop can be drilled, but in a wet fall, seed can be flown into standing corn, cotton or soybeans. An effective cover crop will suppress almost 100% of marestail, according to Steckel. For Palmer amaranth, it can eliminate a second spring burndown and a late postemergence herbicide application for most Tennessee producers. Steckel says either dicamba, 2,4-D or glufosinate will kill the cover crop the following spring. If a field is planted to a transgenic soybean variety that's resistant to one of those herbicides, the cover crop can be terminated closer to planting, or even after planting, Steckel adds. The weed scientist recommends adding a residual such as S-metolachlor or acetochlor when the cover is killed, but stresses that some formulations appear to do a better job of getting through the cover crop to the soil surface. Steckel says the cover crop can reduce emergence of Palmer amaranth by 50% the following spring. "So you have half of your fight already won," he continues. "And the Palmer amaranth that do come up are delayed. It can take up to 40 days after planting before they get up to three or four inches tall." He rates a cover crop as an excellent non-herbicide strategy. "You're letting shade do a lot of the work, and there's no resistance to shade. All it takes for a pigweed to germinate is a flash of light. If they don't get it, they're not coming up." In a recent study, a cereal rye cover crop changed the weed population dynamics of a research field infested with waterhemp in Illinois, according to Adam Davis, research ecologist with the USDA Agricultural Research Service at the University of Illinois. After a few years of planting the cover crop, "waterhemp begins to not be the dominant species in the weed community," Davis explains. "Over a five- to eight-year period, it drops out, not completely, but it isn't able to come up through thick cereal rye very well." Giant foxtail and marestail do become more dominant in the system, according to Davis, the latter despite being almost completely controlled by a cover crop in Southern climates. Cotton Plant, Arkansas, producer Adam Chappell drills a cover crop right behind the combine using a blend based on the crop that will be planted the following spring. For soybeans, the blend is cereal rye, wheat and black oats, combined with crimson clover. On corn, it's black oats and cereal rye at lighter rates with crimson clover, hairy vetch, Austrian winter peas and purple top turnips, Chappell says. He plants 60% of his soybeans in conventional varieties. In the spring, he plants into the standing green cover, killing the cover on the day of planting and taking out any existing vegetation with either metribuzin and S-metolachlor or chlorimuron, metribuzin and S-metolachlor. "It usually takes five to seven days to kill it," Chappell explains. "We're not disturbing the soil so we're not bringing up any new Palmer amaranth seed. We also have that soil shaded. Palmer amaranth needs sunlight. If we can keep that ground completely covered, they don't germinate well." For early postemergence control on conventional soybeans, he applies fomesafen, S-metolachlor and clethodim. If sicklepod is present, Chappell adds chlorimuron. "We're using the old chemistries, and they're working," the grower continues. "Our weed pressure is low enough that whatever is out there we're able to get." Chappell says the cover crop started out as a tool to control Palmer amaranth, "but it's turned into a soil health issue. I'm so interested in what is happening below ground now. It's one of the things that keeps farming enjoyable for me in a time of thin margins." Producers can throw even more shade at Palmer amaranth, waterhemp and other weeds by going to narrow rows, says University of Missouri Extension weed scientist Kevin Bradley. "You get a quicker canopy and reduce the sunlight reaching the soil surface, which means fewer weeds germinating, particularly waterhemp," Bradley points out. "Then if you add effective herbicides on top of those narrow rows, you have something you can write home about." According to University of Arkansas weed scientist Jason Norsworthy, "when you get 95% crop canopy formation, weeds cease to emerge because they're not going to be able to get ahead of the crop." Losing a field to resistant weeds? According to research by Norsworthy and Bradley, producers can "reset" those fields with a moldboard plow. "Our data says that if you deep-till that field one time, you can really reduce your pigweed population," says Bradley. "We don't recommend doing it every year. You don't want to bring those seeds back up to the soil surface and have them germinate." Be careful doing shallow tillage. Norsworthy says research indicates that shallow tillage could stimulate emergence "if Palmer amaranth seed is right at the soil surface or slightly buried." Norsworthy adds that on fields highly infested with Palmer amaranth, some Arkansas farmers deep-till once with a moldboard plow, immediately plant a cover crop, then in the spring plant soybeans in narrow rows. "In those situations, there's very little time where there is bare soil for Palmer amaranth to emerge," he says. "We've had a lot of success with that even in furrow-irrigated soybeans." To manage herbicide resistance, producers should avoid monoculture cropping systems, or back-to-back crops of soybeans or corn, says Arlene Cotie, technical development manager for Bayer CropScience. "That's where you start to build up resistance issues." An ideal crop rotation is from a cereal/grain crop to a broadleaf crop, such as a corn/soybean rotation, which can expose weeds to different chemicals, management practices, tillage approaches and equipment. Rotate herbicide-tolerant technologies, too, Cotie says, "so you can use multiple effective modes of action in your weed control management." Dane Bowers, herbicide resistance technical product lead for Syngenta, says producers should research carefully before rotating herbicides as part of a resistance management plan. "If you use S-metolachlor in corn one year, then rotate to acetochlor the next, you're using the exact same site of action (Group 15, long-chain fatty acid inhibitors). So that's not having any effect on resistance management." On the other hand, rotating two different effective modes of action probably does delay development of resistance to some extent, according to Bowers. "If it takes five years of exposure for a herbicide to find resistance, for example, then rotating sites of action may take you out to 10 years." Rotating weed control technologies is a good way to rotate sites of action, for example, shifting from dicamba soybeans to glufosinate soybeans. "That's much better than using the same technology and the same herbicide year after year," Bowers says. However, the best management plan is to use at least two effective modes of action every time you make an application, he stresses. "If you're using two effective modes of action, and there are a few plants in a population resistant to one of the modes of action, and the second mode of action is effective on it, then there are no survivors so no seed is produced. That becomes a much more sustainable situation over time." Zero tolerance is a take-no-prisoners, throw-everything-including-the-kitchen-sink approach to keeping weed seed out of the soil seedbank, whether it's harvest weed seed destruction or hand hoeing. "It's removing resistant weeds from your field at all costs," Cotie says. "If you don't achieve zero tolerance, what's left in the field can be your nightmare the following year," she explains. "Farmers have another opportunity to affect next year's weeds and that is by destruction of weed seed at harvest time by various means." A couple of years from now, that loud noise coming from the back of your combine could be the sweet sound of Palmer amaranth and waterhemp seeds meeting their violent end at the hands of a device called the integrated Harrington Seed Destructor (HSD). Combines with the integrated HSD option are currently operating in Australia. De Bruin Engineering, the manufacturer of the HSD, is working on a slightly different version for U.S. combines. The HSD was invented by western Australia farmer Ray Harrington. Weed scientists in Illinois, Maryland and Arkansas are testing HSD technology as part of a USDA-ARS Areawide Pest Management Program-funded project on integrated weed management. In total, the project has four sites in the north-central U.S., five sites in the south-central U.S. and five sites in the mid-Atlantic U.S.
Their job is to turn a negative aspect of the combine–its propensity for spreading weed seed through a field, into a positive one–diverting that weed seed into a combine-mounted cage mill that grinds up the seed and destroys it. Scientists first had to make sure the HSD would capture and destroy seeds across different geographies. There's positive news there, too. In the first two years of the study, researchers found that across most locations, both waterhemp and Palmer amaranth retain as much as 95% of their seed at harvest, much of which could enter the combine. Giant foxtail does not retain a majority of its seed at harvest, and giant ragweed varies from year to year, testing showed. There's no doubt that once weed seed enters the HSD, the chances of survival are slim to none, according to Arkansas' Norsworthy, who is testing a stationary version of an integrated HSD. "We had over 99% kill of a dozen weeds, including Palmer amaranth, sicklepod, morningglory, barnyardgrass and johnsongrass," Norsworthy explains. "With cocklebur, we had a 97% kill. If we can get better than a 90% kill on whatever is coming through the HSD, we're accomplishing a lot." Research also shows the HSD reduces the amount of Palmer amaranth and waterhemp weed seed returned to the soil seedbank by 80% versus a combine without the feature. This reduction can have a significant impact on weed control, Norsworthy says. "When we have extremely high populations of weeds in the crop, it's very difficult to control them, especially with postemergence herbicides. If we can reduce weed populations to lower numbers with the HSD, the following year we're going to have better herbicide coverage and efficacy. So it's a win-win situation." Norsworthy says the HSD "has to be integrated with chemical tools. What this brings is greater complexity and diversity to your weed management program. And in turn, the risk for herbicide resistance is going to decrease." Powerful sources of evolution are always at work, even with the HSD, stresses Stephen Powles, a weed scientist and director of the Australian Herbicide Resistance Initiative in western Australia. "The HSD will select for plants that shed seed before the harvest operation, or for plants that grow under ground cover that don't get cut and put into the combine." Norsworthy believes an integrated HSD in combines could be cost-effective for U.S. producers at around $75,000. "Distribute that over 3,000 to 4,000 acres, you've got less than the cost of a herbicide application in the cost of running the HSD." University of Illinois Extension weed scientist Aaron Hager says the biggest advantage of harvest weed seed control practices is that they attack the weaknesses of some of the most troublesome resistant weeds. "The most vulnerable stage of the life cycle of waterhemp is not a 4-inch-tall weed that's already out of the ground," Hager says. "The vulnerability is in the seed because they do not remain viable in the seedbank very long, probably seven years for waterhemp." If farmers use practices that prevent waterhemp from making seed, "after three or four consecutive years, you're going to see your weed population numbers plummet," Hager continues. "That's the key. It's not opening a new jug. We've done that repeatedly, and nature has proved us wrong every time." Until the integrated Harrington Seed Destructor arrives in the U.S., producers can employ another method of seed destruction–narrow windrow burning. In the fall of 2016, Arkansas farmers practiced it on around 40,000 to 50,000 acres, says University of Arkansas weed scientist Jason Norsworthy. In a three-year experiment, when an effective herbicide program was combined with narrow window burning, "we saw a 54-fold reduction in the Palmer amaranth soil seedbank," Norsworthy explains. "Where we just had an effective herbicide program by itself, we had an 18-fold reduction. Harvest weed seed control practices allow you to take it to another level in terms of minimizing your return to the soil seedbank." If smoke is an environmental issue for producers using narrow windrow burning, an alternative is to leave the windrow over the winter to rot, although this method is not as effective as burning, according to Norsworthy. Adds Stephen Powles, a weed scientist and director of the Australian Herbicide Resistance Initiative in western Australia, "Some farmers funnel the chaff onto permanent tram lines for machinery, which are a pretty hostile environment." There's also a practice called chaff lining, in which the chaff and seed from the combine is concentrated in a band 3 feet wide or less. "You've reduced weed seed distributed in a 30-foot swath and concentrated it into 3 feet," notes Adam Davis, research ecologist with the USDA Agricultural Research Service at the University of Illinois. "This forces weed seed to compete with each other when they germinate. Most of the seedlings in that windrow are going to die, and you don't have to burn it to get that effect." Building a combine-mounted chute for narrow windrow burning cost Helena, Arkansas, farmer Harry Stephens less than $200 and a few hours of labor. Stephens copied the chute design he saw at a University of Arkansas research station, using square, metal tubing and 3/8-inch exterior plywood. He installed the chutes on his 9870 John Deere combines. "It was real simple. It takes no more than an hour to install or remove," Stephens explains. "It's a wonderful tool." In 2016, he practiced narrow windrow burning on 5,000 acres after a crop of glyphosate-resistant soybeans. Mother Nature caused a few problems that fall, Stephens says. "When we started burning, we got at least a tenth of an inch of rain seven out of 10 afternoons." Because of the wet conditions, parts of the windrows did not burn properly, "and those areas came up with a lot more Palmer amaranth," Stephens points out. The following spring, Stephens planted 100% dicamba-resistant soybeans and applied S-metolachlor behind the planter. On his stale seedbed ground, he added paraquat to the tank. On broadcast soybeans, he made one postemergence application of pyroxasulfone and an approved, low-volatility formulation of dicamba. On the stale seedbeds, which were planted in 38-inch rows, he made a second application of pyroxasulfone and dicamba. It cleaned up the Palmer amaranth, with no drift incidents. Because his fields were so clean, he dropped back to just a few hundred acres of narrow windrow burning in the fall of 2017. "We just didn't make any seed for the (2017) burn," he says. To light the windrows the first year, Stephens drove perpendicular to the windrow direction, lighting the ends with a hand-held torch, "which wore out my arm," Stephens laughs. In 2017, the torch was attached to a four-wheeler. Here is a good site to quickly find sites of action for various herbicides and their active ingredients.